An assisted living community can provide the necessary social interaction, health monitoring, medication management, and assistance in daily living tasks, to help seniors live longer and more safely. The decades-long study showed that loneliness and isolation from social interaction can actually shorten a person’s life. Seniors can be isolated through choice, as well as circumstance. Physically, some seniors may not be able to attend social activities such as worship services or community events, while other seniors may be content with staying at home. The study has shown that the impact of the social isolation is the same, in either case. Assisted living centers provide opportunities for social interaction to help to alleviate feelings of social isolation and loneliness. Assisted living centers offer a wide variety of activities to stimulate mind and body, and should have an employee dedicated to this task. Arts and crafts, sing-alongs, and resident skits and programs allow for creative expression. Religious study and singing feed the soul. Special events, parties, and celebrations offer something for seniors to get excited about and look forward to. Games and exercise are as important for the mind as well as the body. Assisted living centers can provide opportunities to seniors for interaction and friendships with peers. It’s important to be able to talk with others who can understand and empathize with the experiences and feelings seniors face. Often, it is difficult for family members to relate to senior issues, both physical and emotional. Friendly and appropriate human touch (pats to the back or arm, hand-holding, hugs) are a natural part of assisted living centers. Research has proven that people who feel deprived of caring physical touch experience greater degrees of depression and stress than others who receive this type of physical contact. Biologically, human touch offers its own health benefits. “…Holding a person's hand can lower blood pressure and reduce pain, while yet another [study] showed that people who don't have physical contact can have higher levels of stress hormones and inflammation, TIME pointed out." 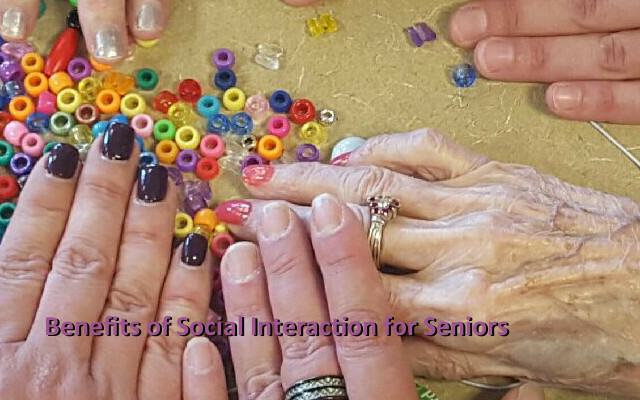 (3) Whether provided by nurses, social workers, volunteers, or friends, the positive impact of the touch is the same. Family, friends, and caregivers should watch for signs of decreased cognitive function, which can be indicators of feelings of social isolation. Not bathing, not preparing regular meals, experiencing difficulty in dressing or common household tasks, and/or forgetting to take prescribed medication are behaviors that indicate a senior is in need of help. The solution seems clear: an assisted living community can provide the necessary social interaction, health monitoring, medication management, and assistance in daily living tasks, to help seniors live longer and more safely. Please contact us and we can provide more information and resources to assist you in this very difficult time in your loved one’s life and your own.